CoversDirect® Center Console Cover will offer protection for your console, electronic equipment, and controls. An elasticized hem and heavy duty strap system allow for a more customized fit. Poly-Guard is made in the USA from durable 100% marine - grade polyester. 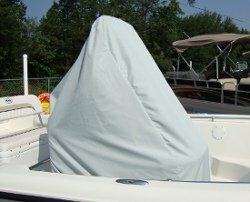 Extremely water repellent and UV resistant, this material makes an excellent choice for a boat cover in just about any environment. Poly-Guard is a breathable fabric, meaning that air is allowed to penetrate the material, discouraging the formation of mild or mildew. The breathability of this material makes it a great choice specifically for areas which experience high humidity and moisture. Poly-Guard weighs 8 oz per yard, so it is lightweight and easy to handle. It offers the highest tear strength of all our materials. This material comes with a 5 year warranty. Sunbrella is a highly respected, USA made, name brand material made fully from strong acrylic fibers. This material is highly water repellent, but what it is really known for is its ability to provide an almost 100% UV "block", offering you the best intense sun protection available. Sunbrella is a breathable material, so any moisture or heat underneath the cover will be allowed to breathe back out. Sunbrella is one of the most fade resistant materials available on the market. This material is so durable that we back it with a 10 year warranty. No other marine fabric on earth withstands the ravages of water, sun, salt or wind better than Sunbrella®.